Ethics and Religion: March 9, 2017: Column 1854: Why Have "Religious Nones" Tripled? 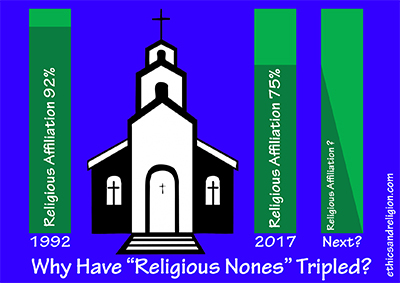 Why Have "Religious Nones" Tripled? Why has the percentage of people with no religious affiliation tripled from 8% of the population in 1992 to 25% at present? What happened around 1992 to set off a meteoric rise in "Religious Nones?" Dr. Anthony Horvath has the answer: "It can't be the Internet, as its time was still to come." Rather, he says the answer is that "Since 1970, marriage rates have dropped precipitously as divorce rates skyrocketed. The cultural respect for marriage as an institution was severely undermined by the `sexual revolution' of the 1960s." He notes that the 1990s was almost the exact time that the first children born under the "no fault divorce paradigm would themselves come to age, graduate from high school, go to college and begin thinking about finding a mate." What most impacted these youth was their experience of growing up in home without a father. Horvath, director of an apologetics organization, Athanatos Christian Ministries, asks a profound question: "How can you accept that God is a loving father when all you have known in your own family is brokenness?" The Pew Research Center recently posed an alternative thesis for the "rise of those who claim no religion at all" - President Obama's Administration. When he took office, those who identified as atheists or agnostics along with those who said their religion was "nothing in particular," totaled 16% of the U.S. adult population. When Obama left office eight years later, the non-religious in America made up nearly a quarter of the population, Pew notes. However, Pew is wrong. The trend started eight years before Obama. As Horvath notes, in 1992 only 8% of Americans were "Religious Nones." That figure tripled by the time Obama left office. Horvath puts his finger on missing fathers: "Studies show that the biggest factor in successfully transmitting the faith to the next generation is strong families that are grounded in the faith. The influence of the father, in particular, is profound." Divorce is one reason fathers are missing in millions of homes. In 1969 when California Gov. Ronald Reagan signed the first "No Fault Divorce Law," there were 639,000 divorces. No Fault swept virtually all states in six years, pushing divorces up to 1,036,000 by 1975. Since 1975, half of all marriages have ended in divorce. However, divorce is not the only factor behind disappearing fathers. Soaring cohabitation may be a bigger factor. In 1960 only 430,000 unmarried couples were living together, but a stunning 8.3 million were cohabiting in 2015, only 1.3 million of whom married. What happened to the other 7 million? Mostly they broke up. On average, cohabitation ends after only 15 months. One result: Census reports that the number of never-married Americans has more than quadrupled from 8.7 million in 1970 to 41.3 million in 2014. Thus, as my wife and I noted in our book, Living Together: Myths, Risks & Answers, cohabitation "is an invisible cancer at the front end" of marriage, diverting tens of millions from getting married at all. And cohabiting couples are just as likely as married couples to have children: 39% of cohabiting couples in 2015 had kids vs. 40% of married couples. A final factor in the rise of fatherlessness is that fewer adults are getting married. There were more weddings in 1970 (2,159,000) than in 2015 (2,077,000). If the same percentage of people were marrying now as 45 years ago, there would be 1.3 million more marriages a year. What can be done to strengthen fatherhood? Horvath asserts, "First, the church has to pour resources into stabilizing marriage, equipping mothers and fathers to lead happy, healthy families. Second, the church needs to understand that fathers, in particular, have a disproportionate effect. They must be helped to be the pastors of their families. "Finally, fathers have to be grounded in Biblical knowledge." He quotes Malachi 2:15-16: "Did he not make (the man and woman) one, with a portion of the Spirit in their union? And what was God seeking? Godly offspring. So guard yourselves in your spirit, and let none of you be faithless to the wife of your youth." "I hate divorce, says the Lord God of Israel..."
Churches can also cut citywide divorce and cohabitation rates. My wife and I have helped 10,000 churches in 230 cities create "Community Marriage Policies" to help them better prepare, enrich and restore marriages. Result: divorce rates fell 17.5% and cohabitation by one-third. Marriage can be restored, giving children a mother and father for a better future.